You’ve built a survey and are ready to make it available to potential respondents. But how do you convert those potential respondents into completed responses, especially when it is so easy for surveys to get lost in today’s already survey-saturated world? This best practice guide offers several tips on how to optimize your surveys to ensure they get noticed and maximize your survey response rate. When inviting potential respondents to take a survey via email there are a number of ways to optimize the email to make sure your survey invitation is seen by recipients. The list of email subjects you shouldn’t use is actually quite extensive. Luckily, there are several online resources available to help you proofread email subject and body text. It is important that you trigger a connection with the email recipient at first glance, beginning with the “From” information and subject line. Make sure the email “From” name is something your recipients will recognize. If recipients don’t know who the sender is right away, they will get suspicious and are less likely to open your email invitation. If your organization isn’t clearly presented in the “From” email address used, make the effort to create a new email address or be sure to at least include your company name in the email subject line. While we’re on the topic of subject lines, remember: less is more. A general rule of thumb is to limit subject to 50 characters or less. Keep it simple and remember to avoid spammy words and characters. Send a test invitation to friends or colleagues to see how long it takes them to answer to those three questions. Recommended Tool: Checkbox’s Email Invitations Wizard allows you to create an unlimited number of email invitations for any given survey. Depending on your plan you can deploy between 50K – unlimited number of invitations to recipients per month. After an invitation is sent, you can filter recipients by who has responded, opted-out, or deleted an invitation. A potential homebuyer makes up her mind within the first 8 seconds of walking through the front door. A website viewer decides whether or not to stay on a page in under 3 seconds. The same rules apply to survey respondents. It’s all about the first impression. If potential respondents don’t like what they see right off the bat, they could lose interest without even glancing at the first question. Make the extra effort to create a dynamic style template for your surveys. The majority of survey located “above the fold” – All of the important information you want to present to a respondent (messages, questions, logos, buttons, etc. ), should be clearly placed “above the fold”, a term borrowed from print media that translates to the web as visible without scrolling. Strategic color placement creates some visual interest without overpowering the survey questions. Contrasting text makes sure important information stands out. Branding! Include a company logo in the header or footer of your survey and use your brand colors in survey elements like borders, progress bars, and navigation buttons. You want respondents to recognize your brand in those first precious seconds so be sure to reflect your company or organization in your survey design. No third party branding – If you are using a third party survey creation tool to build surveys or forms, try to find one that doesn’t brand every page of your survey with their own company logo. This can be confusing to respondents and diminishes the professionalism of your survey. 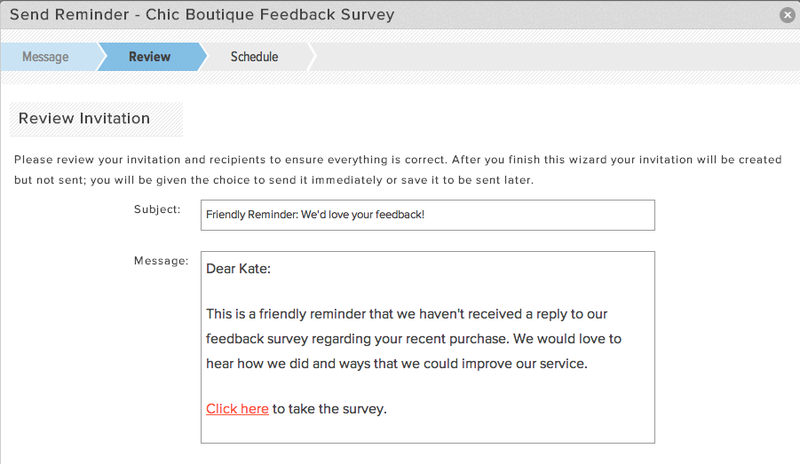 Recommended Tool: Create customized survey style templates within Checkbox’s Style Manager. Templates can be applied to multiple surveys to maintain a consistent campaign look and feel. Customizable features include progress bars, background colors and images, buttons, borders, matrix styles, headers, footers, body text, and more! Depending on your plan, you may also have access to edit survey css, opening up even greater customization possibilities! The information included on the first page of a survey should clearly identify who the survey is from, what it is for, and should set clear expectations on how much time the survey is expected to take to complete. Time yourself taking the survey to gauge an estimate. Knowing the time needed to complete the survey in advance allows respondents to schedule the time to complete the survey. If no time estimate is indicated and a respondent begins the survey assuming it will take 5 minutes, he is more likely to abandon the survey after the 5 minutes he allotted himself has been spent. Another best practice is to include survey progress markers, such as page numbers and progress bars, on every page of a survey. Progress markers allow respondents to track their progress, encourage them to continue, and set expectations for how much more time will be needed to complete the survey will take. If there is no end in sight, respondents may be more likely abandon the survey. Recommended Tool: Mention the survey length in a Checkbox message Item on the first page of a survey. Checkbox also offers progress markers such as page___ out of ___ indicators a customizable progress bar that lets the respondent know how far they are in the survey. The “above the fold” rule doesn’t stop on the first page of a survey. If at all possible, avoid long lists of survey questions. Scrolling through pages wastes time and can be frustrating for a respondent, reducing the likelihood that they will complete your survey. Try to keep the number of questions on a page under 5 to ensure your navigation buttons (next, back, submit) are kept in sight at all times. 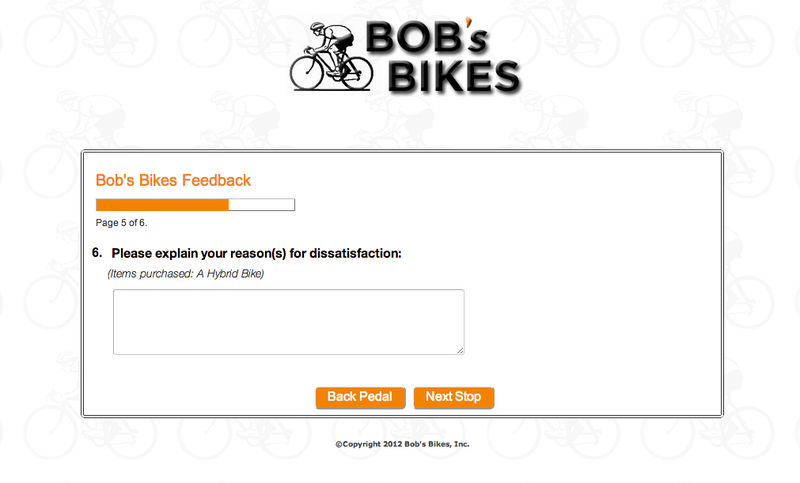 Having the buttons visible encourages respondents to continue. Ask conditional, qualifying questions to determine which questions can be hidden from respondents. This not only tailors your survey to each individual respondent but also condenses the overall survey by weeding out irrelevant questions. In the same vein, as conditions/skip logic, text merging can be used to prepopulate default values, such as contact information, to save the respondent time. Recommended Tool: Set up page conditions, item conditions, branching rules, and use the merging to tailor the survey to respondents. Although we like to think that respondents want to spend their time completing our surveys, the truth is most of the time they could use a little motivation. Offering an incentive for completing a survey is a sure-fire way to increase a survey’s response rate. Although incentive offers almost always yield a higher number of responses, be aware that the quality of responses can sometimes be compromised by the desire win a prize. If you think respondents might be racing through surveys for the reward without putting much thought into their answers, consider changing the incentive offer or removing it all together. 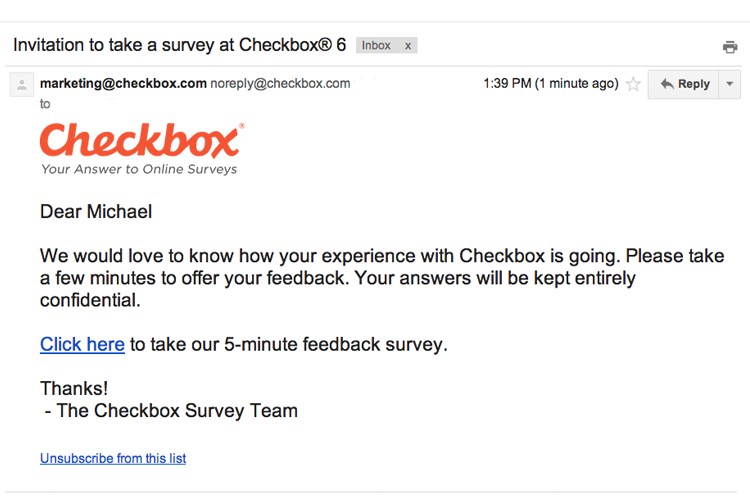 Recommended Tool: Checkbox lets you create customize survey templates to reflect your brand. No technical knowledge is required. Give respondents a meaningful reason (other than a prize) to complete your survey. Think about who is responding to your survey and establish your relationship with them right away. Are your target respondents employees? Customers? Whoever your respondents are, they aren’t going to give your survey a second look if they don’t feel invested in it in some way. The latter could be accomplished by describing how the respondent feedback could benefit them down the line. Before making a survey live to potential respondents, make sure you and a few others test the survey for grammar, flow, ease of use, and if you included conditions, test all of the possible logic paths. If you have difficulty taking the survey, so will your respondents. Avoid confusion and survey abandonment by always testing surveys before deploying. 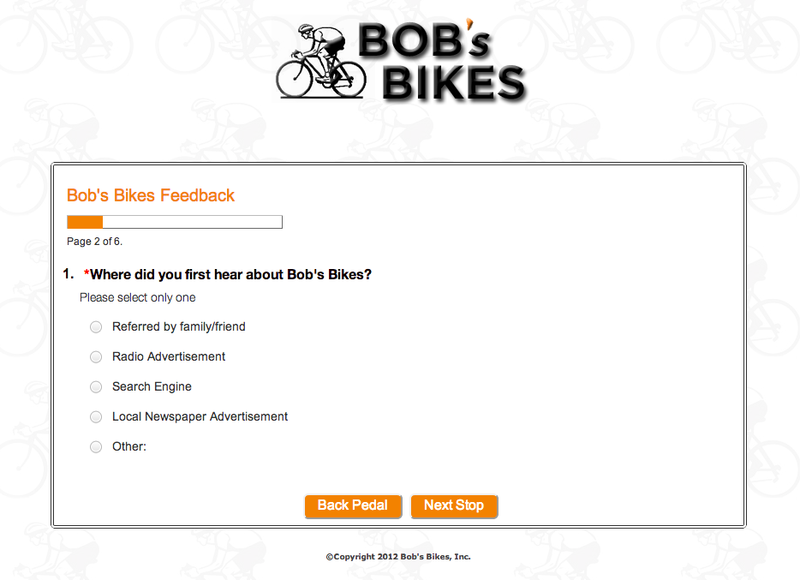 Recommended Tool: Test surveys at any point during the survey creation process. You can even share a test link to allow others to test your survey. Sometimes all respondents need to complete a survey is a little push. Just because they didn’t respond to your survey the day you launched it doesn’t mean they didn’t want to. Maybe they simply got busy and forgot. Because this is often the case, it doesn’t hurt to send or post a reminder towards the end of a survey response period. Create a sense of urgency in survey reminders by informing respondents that time is running out to get their voices heard. Don’t get carried away, though. One or two reminders should be enough to boost your response rate. Recommended Tool: Using Checkbox’s powerful Invitations Manager you have the ability to filter recipients by response status and send reminders to anyone who hasn’t responded.